Party like it's Apple returning free cash flow. 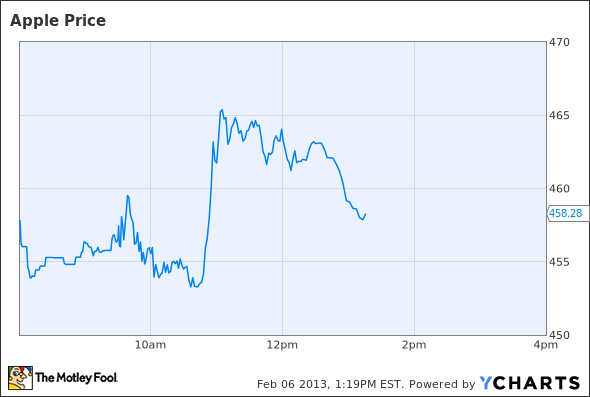 It started off as a relatively slow morning for Apple (NASDAQ:AAPL) shares, down in line with the broader market. The stock was trading lower and touched $452.58 halfway through the morning, and all of a sudden shares leapt higher on heavy volume by nearly $14 to hit $466.50 -- green turf, for those keeping score at home. What was feeding the bulls? Renowned mutual fund manager Bill Miller is out with some bullish sentiment on the Mac maker, saying that shares are undervalued at current prices. The Financial Times ran an article last night on his stance, which began to make the rounds today. In it, Miller compares Apple to Nike as a strong consumer brand with "great loyalty" among customers. That comment would please Steve Jobs, since he had always admired the brand that Nike had built. Miller is widely known as a value investor, even as he appreciates a good growth story when he hears one. Miller's bullishness on Apple is nothing new, but having a high-profile value investor reiterating optimism over the company's prospects is more evidence that Apple is transitioning to a value stock that can attract dividend and income investors. Miller is also doing an interview on the WealthTrack TV show that airs this Friday, and a preview was disseminated last week. Much of the discussion revolves around Apple's capital allocation and how its balance sheet alone can become a powerful catalyst for a recovery. The fund manager goes as far as to call Apple a "Dr. Jekyll and Mr. Hyde company" since it has such an innovative culture within technology, yet is "terrible" at allocating capital since it generates more cash than it knows what to do with. Apple's current dividend was only made possible by Tim Cook, and is certainly conservative relative to Apple's cash generation. One suggestion is for Apple to simply continue sitting on its $137.1 billion in cash, but simply distribute future free cash flow in the form of a dividend to shareholders. That move alone could send shares higher to the tune of 50%, according to Miller. Let's dig into this notion a little bit. Apple's free cash flow has soared in recent years as it continues to mint money from operations. Capital expenditures have also risen as the company invests heavily in product tooling and manufacturing gear as well as expanding and remodeling retail locations to a lesser extent. Sources: 10-K and 10-Q filings. FY = fiscal year. Figures may not sum exactly due to rounding. To put these figures into context, in the fiscal first quarter, Apple generated more free cash flow than it did through all of fiscal 2010. In the meantime, Apple's current quarterly dividend of $2.65 amounts to about $2.5 billion per quarter. The company also repurchased about $2 billion in stock last quarter, a little more than offsetting share dilution from equity compensation, which is the whole goal of the program. Needless to say, if Apple were to boost its dividend by over eight times, I would expect investors to party it up with all the cash coming their way. While it seems that Apple could afford to do so since it has more than enough cash to run the ship, it's not quite that simple. The $137.1 billion money mountain currently consists of $94.2 billion internationally and $42.9 billion stateside. Not only is roughly 60% of sales generated internationally now, but Apple also legally funnels revenue abroad as part of its tax strategy. This is why Apple's international cash always increases sequentially, while its domestic coffers change less predictably and occasionally decline. Since most of its cash is being either generated or funneled abroad, paying out all of free cash flow faces the very significant hurdle of repatriation taxes. Still, Apple can and should increase its dividend to reinstill confidence among investors. Its payout ratio still lags rivals that have worse prospects than itself -- namely, Microsoft and Intel. Miller's free-cash-flow payout idea sure sounds nice, but ultimately it's not realistic due to the international composition of Apple's cash. But no one will argue that Apple can't afford a dividend hike of some degree.